When I was in high school, my neighbor gave me a basket of chocolate covered fruit. There were individually dipped pineapples, strawberries, but best of all were the grapes. Chocolate and grapes make a surprisingly delicious combination. I love to make them myself when the grapes are really good. And today we got our first taste of perfect, red grapes. So excited! I don’t individually dip the grapes. That would take too much time and isn’t necessary. In fact, I like breaking them apart as I eat them. Don’t worry if the chocolate breaks a little. 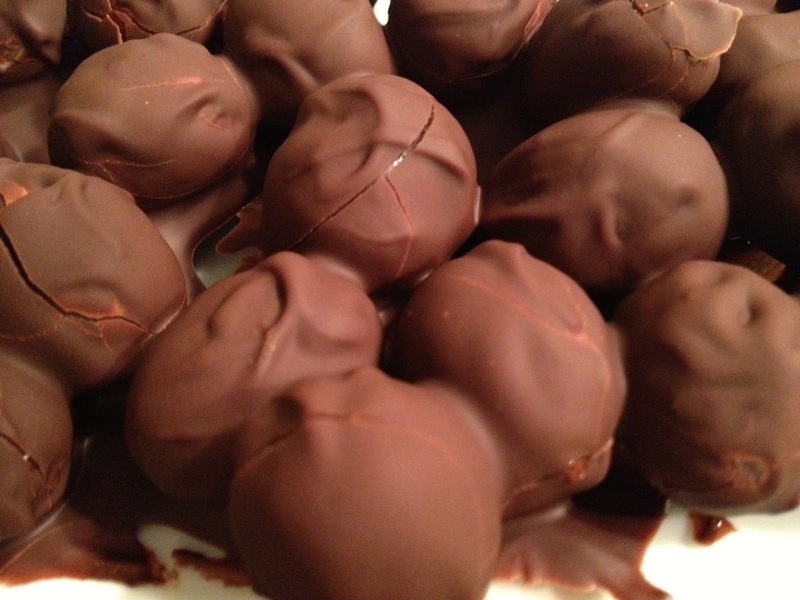 The whole point is to have chocolate covered grapes and not perfectly coated chocolate covered grapes! Wash and dry the grapes. Make sure they are completely, 100% dry, or else the chocolate will seize up. Melt the chocolate in a double boiler. Line a baking sheet with parchment paper and make sure it fits flat in the freezer. Drop grapes into the chocolate. Roll them around and then turn them out onto the baking sheet. Place the tray into the freezer for about an hour. When ready to serve, let them thaw for a few minutes so the grapes are just soft to eat. Break them apart as if you are picking grapes off the vine. Enjoy! It was great meeting you at the salon on saturday. I’m really liking your recipes and especially can’t wait to try this one.